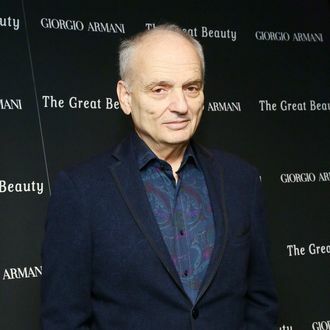 For the Director’s Guild’s spring magazine, Sopranos creator David Chase gave a lengthy interview about what was going through his head when he set up the final scenes of the series. [Spoilers follow if you haven’t gotten around to watching the show in its entirety.] Tied to the finale’s upcoming eight-year anniversary, Chase unpacks how he built all that tension at the end of “Made in America,” how he perfected the pacing and flow of the last few scenes, why Tony always has to have eyes in the back of his head, why the framing and shot selection was so important in the diner, and how the “big moment,” always out there waiting, played into all this. We recommend you read the full breakdown, because it’s all an illuminating take on one of the most hotly debated moments in TV history, but here are the highlights. I love the timing of the lyric when Carmela enters: ‘Just a small town girl livin’ in a lonely world, she took the midnight train goin’ anywhere.’ Then it talks about Tony: ‘Just a city boy,’ and we had to dim down the music so you didn’t hear the line, ‘born and raised in South Detroit.’ The music cuts out a little bit there, and they’re speaking over it. ‘He took the midnight train goin’ anywhere.’ And that to me was [everything]. I felt that those two characters had taken the midnight train a long time ago. That is their life. It means that these people are looking for something inevitable. Something they couldn’t find. I mean, they didn’t become missionaries in Africa or go to college together or do anything like that. They took the midnight train going anywhere. And the midnight train, you know, is the dark train. Tony hears the bell when the door opens and he’s repeatedly looking up when he hears it throughout the scene. That rhythm is very important to the scene. The bell harkens back to the first episode [of the second part] of the final season called ‘Sopranos Home Movies,’ when Tony is out on a dock on this lake, and every once in a while a boat’s bell dings and brings him out of himself and back to the present. So here’s the bell again, and sure enough, he looks up, and then he gets distracted, and there’s the bell again. In my mind, it’s like a meditation bell. Not to be thinking about the past, not to be thinking about the future, only about now. It’s like the song ‘This Magic Moment.’ I used that at the end of ‘Sopranos Home Movies,’ and it’s one of the songs he sees on the jukebox in this episode. I tried to build the tension and suspense as much as possible. That’s why I could go back out to Meadow and her car-parking. … Meadow is filled with nothing but very, very deep emotions about parking her car. But possibly a minute later, her head will be filled with emotions she could never even imagine. We all take this stuff so seriously — losing our keys, parking our car, a winter cold, a summer cold, an allergy — whatever it is. And this stuff fills our mind from second to second, moment to moment. And the big moment is always out there waiting. … Framing is extremely important. I think it makes you feel so much below the level of verbiage and words. What they’re talking about is how good those onion rings are. For me, food is always central to a feeling of family and to a feeling of security and happiness. A.J. had remembered a moment at the end of the final show of the first season when they were all sitting down, eating in Vesuvio’s Italian restaurant and Tony said, ‘Just remember … value the good times,’ the moments, there really aren’t that many of them. And this is one of the very good times. And yet there’s something wrong with it because Meadow is not there. So the family isn’t really together. I think on some subliminal level that raises the tension. We know the family should be together and they’re not. I just wanted the guy to look over. I didn’t want him to look particularly menacing. And he glances off Tony so quickly. We worked on that quite a bit so he wasn’t staring at him. The guy was like looking around the place in general. Tony doesn’t acknowledge that he sees him. Tony leads a very dangerous, suspicious life and he’s always on guard. But he’s in this old-fashioned American sweet shop with those round stools and the counter and the football hero pictures and Cub Scouts. Everything that should make him feel at ease, and yet there is a slight ill at ease feeling which we bring to it because we know who he is and what he’s done. And he can never be sure that any enemy is completely gone. He always has to have eyes behind his head. … The tension is quite high now, but if you think about it, for no real reason. Who’s in the place? A guy in a jacket, Cub Scouts, a young couple, a trucker in a hat, a couple of black guys in there to buy some candy. … [T]he scene in The Godfather [when Michael Corleone kills Sollozzo and McCluskey] occurred to me; it’s an iconic scene. I would say that Tony checked the guy out at some level. I mean any middle-aged male that would get that close to him, I’m sure he would do some summary surveillance of. It may be very quick; his instincts are very sharp. He doesn’t feel threatened by him but I’m sure he clocks that that guy’s in the bathroom, and that that guy should come out. It’s more like ‘I want to see that guy come out.’ This is all on a subconscious level, I’m sure. We all do this, every moment of our lives. I said to Gandolfini, the bell rings and you look up. That last shot of Tony ends on ‘don’t stop,’ it’s mid-song. I’m not going to go into [if that’s Tony’s POV]. … Whether this is the end here, or not, it’s going to come at some point for the rest of us. … I thought the ending would be somewhat jarring, sure. But not to the extent it was, and not a subject of such discussion. I really had no idea about that. I never considered the black a shot. I just thought what we see is black. The ceiling I was going for at that point, the biggest feeling I was going for, honestly, was don’t stop believing. It was very simple and much more on the nose than people think. That’s what I wanted people to believe. That life ends and death comes, but don’t stop believing. There are attachments we make in life, even though it’s all going to come to an end, that are worth so much, and we’re so lucky to have been able to experience them. Life is short. Either it ends here for Tony or some other time. But in spite of that, it’s really worth it. So don’t stop believing.